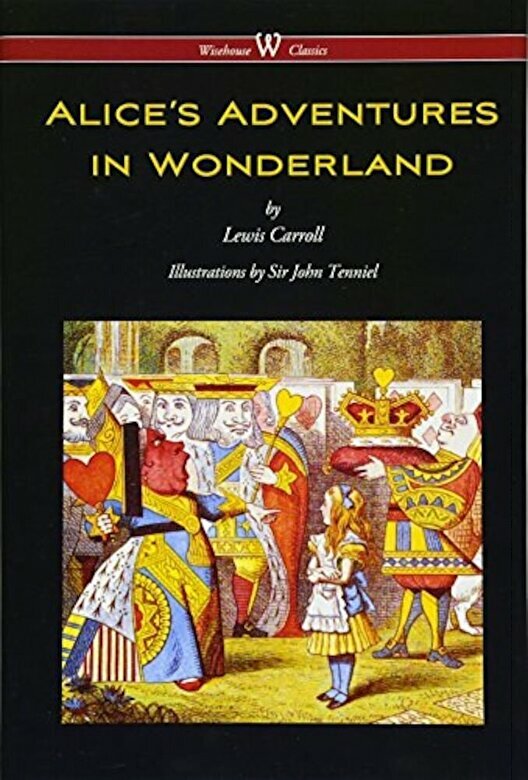 ALICE'S ADVENTURES IN WONDERLAND (commonly shortened to Alice in Wonderland) is an 1865 novel written by English author Charles Lutwidge Dodgson under the pseudonym Lewis Carroll. It tells of a girl named Alice falling through a rabbit hole into a fantasy world populated by peculiar, anthropomorphic creatures. The tale plays with logic, giving the story lasting popularity with adults as well as with children. It is considered to be one of the best examples of the literary nonsense genre. Its narrative course and structure, characters and imagery have been enormously influential in both popular culture and literature, especially in the fantasy genre. Dodgson's tale was published in 1865 as Alice's Adventures in Wonderland by ``Lewis Carroll`` with illustrations by John Tenniel. The first print run of 2,000 was held back because Tenniel objected to the print quality. A new edition was quickly printed, released in December of the same year but carrying an 1866 date. The entire print run sold out quickly. Alice was a publishing sensation, beloved by children and adults alike. Among its first avid readers were Queen Victoria and the young Oscar Wilde. The book has never been out of print. Alice's Adventures in Wonderland has been translated into at least 174 languages. There have now been over a hundred English-language editions of the book, as well as countless adaptations in other media, especially theatre and film.